This recipe provides a healthier way to a favorite takeout dish for lunch four time using less than an hour to prepare all four meals! Shrimp is quickly sauteed and then tossed in a flavorful blend of soy sauce, sesame oil, ginger, white pepper, and canola oil. Onion, garlic, carrot, green beans, corn, peas, and green onion are stir-fried along with cooked brown rice. The bowls are garnished with additional green onion and can be enjoyed throughout the week! This recipe also works great with leftover rice! Just take it straight out of the fridge and skip the first step in the recipe! Per Serving: 340 calories; 12g fat; 27.5g carbohydrates; 31g protein; 239mg cholesterol; 1641mg sodium. I loved this shrimp fried rice! I made this meal prep to have for dinner on the week that I had to work late. It's super convenient and saves me a ton of time during the week. I love all the fresh veggies, it's really healthy and filling. 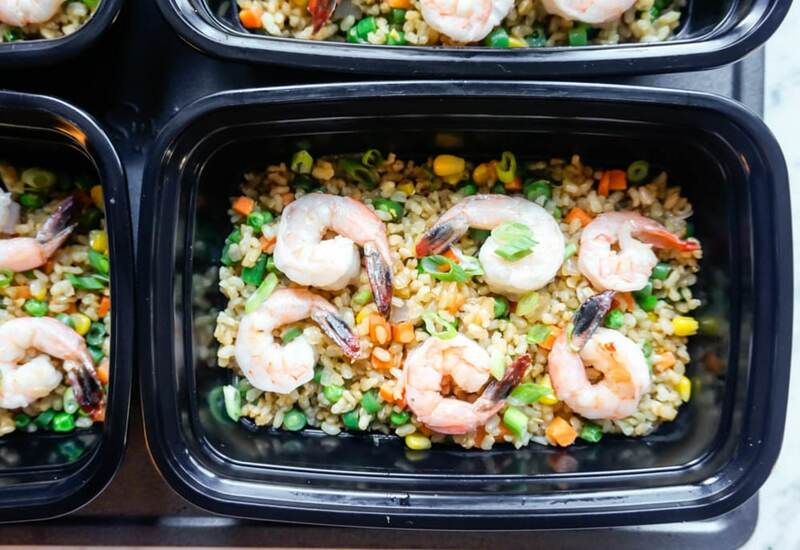 This meal prep shrimp fried rice was so easy to make! I was eating out all of the time for lunch, so this was perfect for me. It was really delicious, better than take-out. All of my co-workers were so jealous! Every since I started working out more I have been trying to find meal prep recipes to help curb my eating out. This recipe is amazing. Instead of the brown rice I used quinoa. Great post workout meal prep. I eat this for dinner during the week. Sometimes I’ll add sriracha or crushed red peppers just to switch it up. I also use the really large gulf shrimp. I live on the coast so they’re easy to get fresh.